Boil gelatin, agar agar powder and sugar in water. Stir until well dissolved, leave for 2mins. Blend tofu, strawberries and evaporated milk in a blender. Pour gelatin & tofu mixture into tofu paste, add strawberry essence and stir well. Pour gelatin and tofu mixture into a jelly mould, cool and refrigerate for an hour. 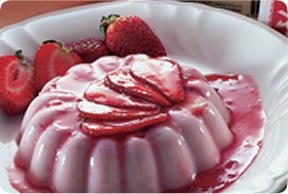 Remove pudding from mould and serve with strawberry sauce or fresh fruit. Replace evaporated milk with low fat milk. Adjust sugar content to suit your taste.